Christmas is a time of little rituals, some public, others particular to individual families. Now we see most of them as traditions – giving gifts, feasting, bringing greenery and light into our homes at this the darkest time of the year. It seems likely that they all originated as rituals to celebrate the return of the sun, the lengthening of the days and the coming Spring. The ‘Hunting of the Wren’ is thought to have originated in Celtic mythology as a Samhain or midwinter sacrifice or celebration. The tiny wren was a symbol of the past year, the European wren sings even in mid-winter, and is known as the “winter king.” Variations of the wren tradition are observed in the Isle of Man, Ireland, Spain and Norway. For more see this Wikipedia article on Wren Day. 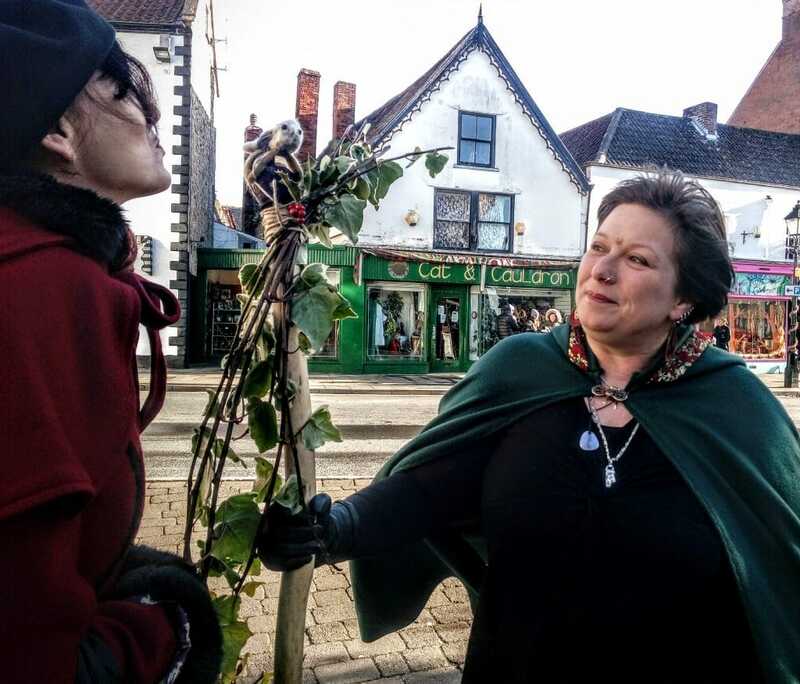 This year Issa decided to bring the tradition of the Wren to Glastonbury with a community procession to Pomparles Bridge where we would perform a short ritual. I woke up on the 27th of December to a gloriously sunny day with just the right amount of chill in the air to feel seasonally appropriate. After the usual Christmas feasting and merrymaking, thanks to some of the Wookey Hole Vikings, I was ready for some exercise. The furthest I’d walked over Christmas was on Boxing Day when we’d taken the Yorkshireman’s Christmas present – a drone copter thingy, over to the field opposite the house. We’d watched it fly off in the opposite direction to what was intended and then crash land into a hedge. Having successfully flown it around the house he hadn’t seen the need to actually read the manual. The procession was scheduled for midday, but most people were running on GMT (Glastonbury Maybe Time), so initially only myself, Issa and Rachel were assembled at the Cross, but gradually we were joined by others until the party numbered eleven. This included Issa with a felted wren mounted on an ash staff, a lady in unicorn wellies, a small dog in a Santa suit, a man in black robes and a studded leather jacket and another man in a sensible hat and a Baphomet t-shirt. This being Glastonbury, and a procession, there were three people beating drums. Then there was I, feeling mildly anxious that I was to be made to sing and so insisting that I was a chronicler rather than a celebrant. As it happened Issa held the proceedings with a light touch and a sense of fun so I joined in without an overwhelming feeling of social anxiety. We processed from the Market Cross along Magdalene Street and then turned into Street Road which we followed to Pomparles Bridge. There was a steady stream of slow-moving traffic alongside us, which we guessed was mostly full of people observing a modern folk custom – heading to the Temple of Consumerism that is Clarks Village to pick up a post-Christmas bargain. Being a cheeky sod I complained at one point that the drumbeat was a bit downbeat and couldn’t everyone ‘jingle bell’ it up a bit (my qualification for criticism being a complete inability to hold a beat myself of course), it did get a bit jollier after that I noticed. We chatted as we walked and I was pleased to hear that the Community Christmas Dinner in the Town Hall had been very well attended and successful. I asked Issa why she had chosen this route, if this was a traditional processional path. She explained that if it wasn’t traditional it was certainly well used, as the passing traffic testified. She wanted to help co-create a community ritual that was relevant to our lives now, not a fusty, arcane affair where initiates attempted to recreate an imagined past. Pomparles Bridge is believed by some to be the Pont Perilous of Arthurian myth (see John Morland’s essay). Due to the torrential rain over Christmas it was more like Ponds Perilous as the river had overflowed its banks into the surrounding fields and we found ourselves assembled in the mud. You might like to hear The Clancy Brothers version of the Wren Song. They probably managed to sing ‘It’s in the bush that I love best’ without smirking, a challenge I failed, but as folk song tends towards the bawdy the double entendre was presumably intentional. We made various departures from the traditional Wren Celebrations. The wren was originally hunted on St Stephen’s Day (now Boxing Day) but the chances of assembling a small crowd then would have been slight, and at 6am in the morning nonexistent. Of course, we weren’t hunting a wren either, killing small birds with bows and arrows no longer being seen as appropriate. Nor were we collecting pennies for the wren’s burial. Instead, Issa had fashioned a facsimile wren in felt and mounted it upon an ash staff. For these reasons it was decided that our little ceremony marked the wren’s resurrection rather than its demise. It was also decided that kissing the wren would be a nice touch, I was taking photos and thought I’d escaped this bit, but my reticence was noted and so I too found myself puckering up to a small felt bird on a stick. Can that be…the Statue of Liberty in Glastonbury? We headed back to town, via Roman Way, Wearyall Hill and Hill Head, curiously I spotted the Statue of Liberty in a back garden in Roman Way, anyone know anything about this? Sorry about the poor quality of the picture but I had to resist my natural nosiness and didn’t head down the drive for a closer look. Click on the picture for a closer look. It’s traditional to round off the Wren ceremony with a party (here’s a great video of the Wrenboys of County Clare, Ireland doing just that in 1979) so we went to the George and Pilgrims, where I sampled a small glass of Viking’s Blood Mead, enjoyed everyone’s company for a little longer and admired the massed baubles that decorate this medieval inn for Christmas. I hope you join us next year.